LAUSD will not place a school parcel tax on the November ballot after the Board deadlocked in a 3-3 vote, following Superintendent Austin Beutner’s request to delay the effort until 2020 so the district will have more time to launch a successful campaign. Board President Monica Garcia (BD2), Vice President Nick Melvoin (BD4) and Ref Rodriguez (BD5) sided with Beutner and voted no, while Board Members George McKenna (BD1), Richard Vladovic (BD7) and Scott Schmerelson (BD3) voted yes. Board Member Kelly Gonez (BD6) was out on maternity leave and did not attend. Everyone on the Board agreed the district is in the midst of a financial crisis and needs more revenue. The debate centered on the best strategy and timing for achieving that goal, as well as the issue of who would benefit if the parcel tax passed. Independent charter school parents testified that the parcel tax resolution specifically excluded them and their kids’ schools. But even after Vladovic offered to add language clarifying that charters should be included and should get revenue proportional to their population, the resolution was still rejected. That was, in large part, due to the district’s own recent polling, which showed that a parcel tax large enough to close LAUSD’s projected deficit was likely to fail in November but could succeed in 2020, when voter turnout in a presidential election year is far higher. District polling did show that a smaller parcel tax might have a narrow chance of succeeding this November, and McKenna, who sponsored the resolution, said he would be willing to support a lower tax that had a better chance of passing this fall. Such an effort would fall short of the goal of eliminating LAUSD’s deficit, though. Parcel tax supporters argued that it would be harder to pass a tax during a Board election year in 2020, and Vladovic made a passionate case that it was worth gambling the nearly $6 million it would cost LAUSD to put this on the ballot now for the chance of getting hundreds of millions in return. The vote comes in the midst of tense union negotiations that many anticipate could lead to an LAUSD teachers strike during the 2018-2019 school year. UTLA declared an impasse in talks with LAUSD on July 2 but then withdrew that impasse Tuesday without explanation, saying it would resume negotiations July 24. While new revenue from a parcel tax is no longer on the table this year, Beutner has been able to secure some philanthropic funding to help improve student attendance, close the opportunity gap for underserved students, and better engage community, families, students and teachers. The Fund for Equity and Excellence is launching with just over $3 million from the Ballmer Group, California Community Foundation, California Endowment, The Eli and Edythe Broad Foundation and Weingart Foundation. Beutner was also able to secure potentially hundreds of thousands worth of pro bono legal services from the Latham & Watkins law firm to help advise LAUSD on its impending financial restructuring. While the parcel tax issue divided the Board, members were more in unison Tuesday on the issue of condemning President Trump’s immigrant family separation policies. 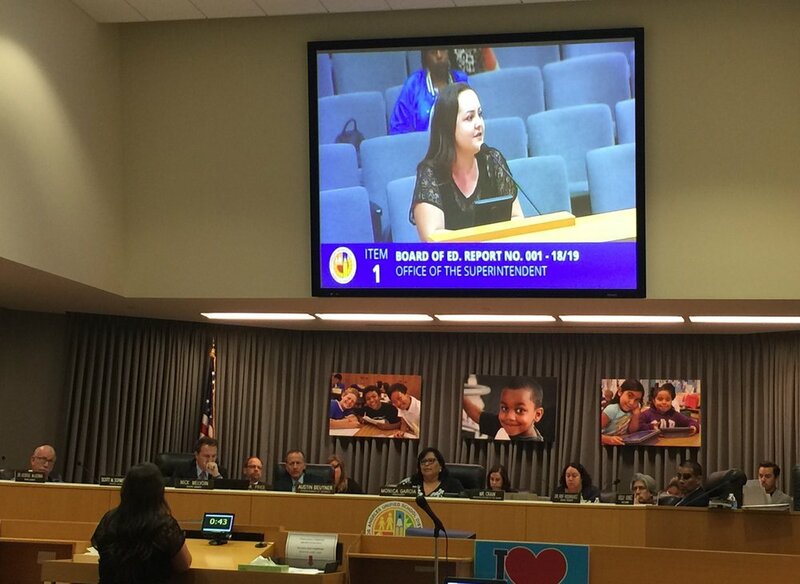 The Board unanimously passed a resolution to help any kids who have been forcibly separated from parents who are being held or housed within LAUSD boundaries. About 100 children separated from parents are being held in the Los Angeles area. The resolution calls for LAUSD to make sure kids being held in immigration shelters, foster homes, group homes or with relatives receive help enrolling in LAUSD schools, as well as crisis intervention, mental health and health services such as vaccinations. The resolution also calls on LAUSD to do all it can to help reunify these children with their parents.